Oxford Creativity’s success in working with clients in-house for over 20 years, involves rapid response to urgent problems, as well as listening and developing customised programmes to embed TRIZ capabilities. We help organisations in their quest for innovation, resolution of difficult challenges and precisely meeting their customers' needs. Your busy teams need only invest 2-5 days to get break-through results. We help you hit the ground running with Oxford TRIZ. Most of our in-house work is with people new to TRIZ, who learn the essential tools and processes in parallel whilst working with us on their urgent challenges. You can collaborate with our Oxford TRIZ experts and set up Problem Solving workshops to tackle solving specific problems, or set up an in-house Patents and New products programme - specifically designed for companies seeking the strategic advantages of strong intellectual property (IP) portfolios. There are also many options for using Oxford TRIZ innovation toolkits for embedding a culture of systematic innovation with both individuals and project teams – so that you’re no longer dependent solely on the spontaneous and occasional creativity of individuals or groups. 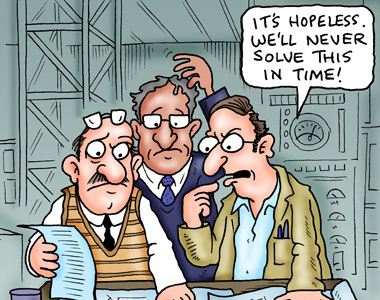 Our Oxford TRIZ Problem Solving programmes are fast, time-efficient and above all, effective. They give you the opportunity to make a real difference to the success of your business by helping you map out a strategic vision for your organisation, or tackle specific problems that you may be facing, regarding anything from design to implementation. Two Oxford TRIZ experts guide and facilitate at all times. We have helped Rolls Royce, BAE Systems, Draeger, Saint Gobain, Sanofi, and many other organisations to solve technical, engineering and business problems – let us help you next. Realise your organisation’s innovation and prediction capabilities with Oxford TRIZ. We will help your teams consistently deliver the fastest, most practical and measureable successes. If we don’t help you meet your targets (agreed at the beginning of each project) then you don’t pay – this is a guarantee we have given for over 20 years and we haven’t failed yet – despite some truly daunting challenges in many engineering and other sectors. With our help, between 2001 and 2007, Sanofi Aventis increased their patents per annum, from 6 … to 276. Creativity in individuals and teams as daily habits needs to be enabled, encouraged and fostered. Using a range of innovation tools including our unique Oxford TRIZkits, available in bite-size chunks or full-day programmes, we show your team how to put into practice the best tools and behaviours to encourage innovation and creativity in themselves and others. We deliver TRIZ learning to you in interactive workshops, at the location of your choice, to fit your time-scales. We offer one-day, 2-day and 3-day options. Oxford Creativity can develop a training programme based on the specific needs of your organisation, teams and individuals. Our structured Oxford TRIZ training can be delivered to professionals with a wide range of skills, or focused on Technical or Business teams as required. We can easily combine TRIZ training with consultancy in other areas you need help – for example Problem Solving or Developing Patents and New Products, to develop a bespoke Customised Programme (link to Customised Programmes). From recent customers such as Draeger and AirDri, to long term realtionships with Rolls Royce, BAE Systems and MBDA , the measure of Oxford Creativity’s success with our customers is that we listen to what they need, and develop customised programmes to meet changing needs. We can put together programmes which resolve your important, long-term or urgent issues , including – fast results to solve specific product development inertia; embedding a culture of Innovation; empowering engineers and technical teams to become more creative and developing Patent Strategy. A low-cost introduction to TRIZ, the Oxford TRIZ Taster provides the ultimate in flexibility - one of Oxford Creativity’s TRIZ experts delivers a 4-hour fast-paced introduction to TRIZ success for up to 20 delegates, at the location of your choice.